Lama Rod Owens is an author, activist, and authorized Lama (Buddhist Teacher) in the Kagyu School of Tibetan Buddhism. He is the co-founder of Bhumisparsha, a Buddhist tantric practice and study community; a guiding teacher for the Thomasville Buddhist Center; a visiting teacher with Inward Bound Mindfulness Education (iBme); and a visiting teacher with Natural Dharma Fellowship and the Brooklyn Zen Center. Lama Rod has been a faculty member for the Harvard Graduate School of Education’s professional education program in mindfulness for educators and has served as a guest faculty member for the school’s course Mindfulness for Educators. He holds a Master of Divinity degree in Buddhist Studies from Harvard Divinity School where he focused on the intersection of social change, identity, and spiritual practice. 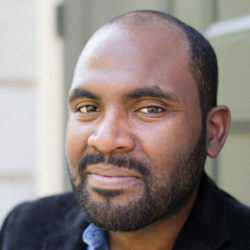 He is a co-author of Radical Dharma: Talking Race, Love, and Liberation and his next book exploring transformative anger and rage is due out in the winter of 2020.